It all started in 2007 as a small project to get me back photographing after spending the prior five months in Montana. Since then it has been a project every November. If you were to ask me then how many years would I do this project, I think I would had answered just a few years not the 10+ years it has been done. In doing this project I have learned a lot, first off November is not the easiest month to photograph but that became part of the challenge. It can also be sometimes difficult to find time to photograph, but by shifting priorities it can be done and force you to manage time differently. Lastly I have had the opportunity to explore the city I live in as well as those I have visited. From San Diego, Alameda, San Francisco, Juneau, Boise, New York and of course Denver they all allowed me to see things a little differently. This year I decided to make the last of the Thirty Days project in its current format. I feel I have taken this to where I want it to be and am now starting to look at new projects. I thank you for your interest over the past years and am excited to tell you about the new projects in the upcoming months. Until then you view all of the images from the project here on the blog under the category – Thirty Days. Today is Halloween and the final day of October. Once again as I have done the past ten years, Thirty Days 2017 will begin tomorrow. It was in 2007 when I decided it would a good month to start a project during the November on a whim. If you are new to following my blog, during the next thirty days I will go out and take at least one photograph every day and select one of these images to post on the blog. The pictures posted may be something I captured in a scheduled shoot (with client permission), planned location, or just a random item while heading down the street. There is not a set rule on what type of camera I capture the image with, however it does have to have been taken on that day. I am looking forward to this once again this year, and hope you will check back often to the blog during the month. After reviewing my schedule I have decided that this summer I will be taking a break from art festivals in the Denver as I focus on a couple of projects. Over the past years I have enjoyed showing my work at the festivals and more so discussing the work with the thousands of people who have stopped by during the various art festivals. I will still be showing new work on this blog, my website as well as on my Facebook Fan Page. Thank you for your continued support and see you at the art festivals in 2018! Today is Halloween and the final day of October. Once again as I have done the past nine years, Thirty Days 2016 will begin tomorrow. Thank you for stopping by my booth at the Cheesman Park Art Fest this past weekend. It was nice to discuss the work with you and answer questions during the two day art festival. If you would like to keep up with my latest work you may become a fan on Facebook where images are posted a few times a week. The fan feedback helps determine if the image will be available online for purchase or at the next art festival. If there was anything you were thinking of purchasing, the majority of my work is available online where you may place an order online. Now through Monday August 8th, if you use the code CP16 at checkout you will receive free shipping on all orders sent within the United States. If there is something you don’t see online, please feel free to contact me directly. Thank you again for visiting over the weekend. This weekend, July 30th and 31st, is the Cheesman Park Art Festival. The festival is located in Cheesman Park and will take place from 9:00 A.M. – 7:00 P.M. on Saturday and 9:00 A.M. – 5:00 P.M. Sunday. This is the fourth year of the Cheesman Park Art Fest and over 125 artists will be on hand at the festival located in the southwest corner of the park. My booth is N7 and is located just north of 9th Avenue. The Cheesman Park Art Festival is the only festival I will be doing this year, so I hope to see you this weekend. This post is originally from 2012, however the elements included are still true in 2016. Over the past few weeks you have been receiving presents and cards from friends and family as well as people you do business with on a regular basis. For the most part this is kept to the holidays as a way of saying thanks. However like the New Year’s resolution you set just a few of days ago why do we limit it to just this time of year. The end of the year and the start of the year marks a set time in our mind where we perform tasks like saying thanks. Let’s look at the resolution you created earlier this week. If the resolution was so important why didn’t you start it on any other day instead of waiting until the first of the year? As I looked at the holiday greetings I received this holiday season, I have noticed the difference between a card received via “snail mail’ and one which was sent in an e-mail or even yet a link to a web page with a generic holiday greeting. This is one of the first years I have really have noticed the difference between getting a note in the mail and one electronically. At the gallery which I own in Denver, this season I received one holiday card in the mail and countless others by e-mail. The one card which I received in the mail hung alone for a few weeks waiting for others to join it, but the only greetings were via e-mail and after a quick scan they were quickly deleted from my inbox. I can clearly tell you the name of this individual who sent the holiday card and if they inquire about having a show at the gallery in the future it may help them get added to the schedule. Should preference be given to someone who sends a physical card versus an electronic card? The process of communicating with a potential business partner is to make yourself memorable when doing so, and in this instance the physical card was memorable. Will this be the same in 2012? Most likely it will be, but I will find out in less than a year from now. I know there is much discussion these days about being green and stewards for the environment when it comes to printed items. This is the reason why a lot of people have moved to the electronic or ‘e’ method of saying thanks at the holidays or at any time during the course of the year. Or is it for other reasons, including the savings in purchasing cards or even more so the speed in which the electronic cards can be sent quickly removing one additional task from our busy lives. Hopefully this is not the same way you are treated when doing business with this person. The bottom line is customer service is king in today’s business place. Taking the time to write a thank you note is something which is appreciated by the person who received the card. Who knows, one of those business cards you include in a handwritten thank you note can make it to some they know resulting in a new customer for you this year. I am sure that alone will be worth the couple of minutes which is took to say thanks. 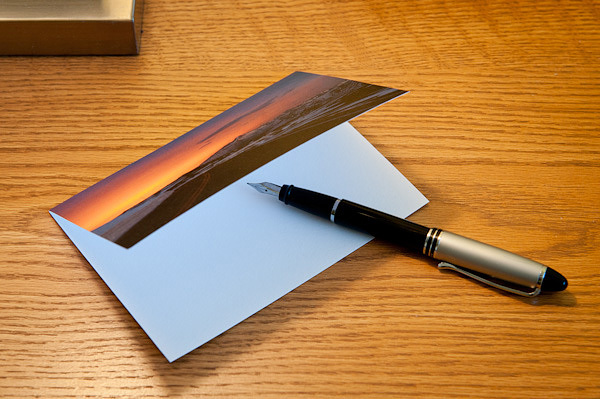 If you do want to have a resolution for 2012 2016, why not make it setting aside fifteen minutes each week and writing a handwritten thank you note. Today is Halloween and the final day of October. Once again as I have done the past eight years, Thirty Days 2015 will begin tomorrow. 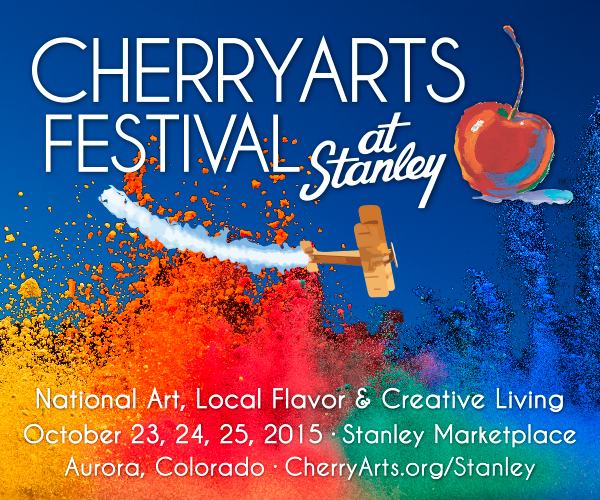 Join me this weekend for the CherryArts Festival at Stanley, produced by the Cherry Creek Arts Festival, which is collaboration with the yet-to-be-opened Stanley Marketplace featuring national art, local flavor and creative living. The art festival is free to attend on Saturday and Sunday from 10am – 5pm each day. Additionally there is a ticketed Friday night gala featuring 70 artists, complemented by tasty creations from future Stanley Marketplace businesses and local culinary establishments – not to mention an open-bar experience of amazing wine, spirits and beer. Stanley Marketplace is located on the edge of Aurora and Stapleton, with best access by Montview and Dallas Street. I look forward to seeing you at this event.